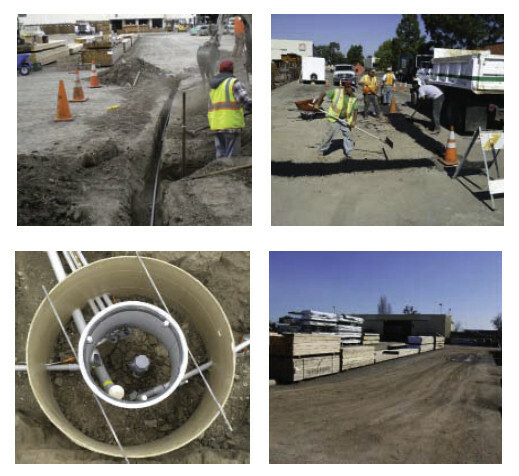 INNOVEX was contracted by Hulbert Lumber in 2008 to design, construct and operate a treatment system for the remediation of petroleum hydrocarbons in soil and groundwater beneath the Site resulting from a leaking underground storage tank (UST) previously located on the property. INNOVEX was selected to manage the project and complete remedial activities based on our technical expertise and extensive experience remediating and achieving case closure for hydrocarbon-impacted sites throughout the Western US. The project location is an active lumber yard. Two Alameda County Water District (ACWD) production wells are located approximately 520 feet northwest of the former UST location. Both wells are actively used to extract brackish groundwater for transport to an ACWD desalinization facility for eventual use as drinking water. Petroleum hydrocarbons were first detected in 1988 during UST removal activities. Due to the proximity of the Site to the ACWD production wells, assessment and remediation of the hydrocarbon plume was a high priority for the State and local regulatory agencies. 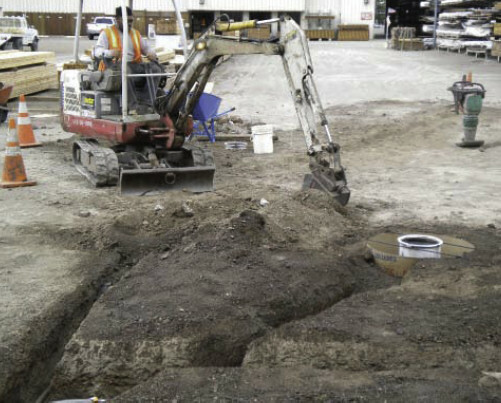 Prior to commencing site cleanup activities, INNOVEX utilized site assessment data furnished by previous consultants to prepare a Remedial Action Plan (RAP) that was submitted to the ACWD. The RAP proposed installing an ozone sparge system connected to twelve on-site ozone sparge wells. Upon receipt of approval from the ACWD for the RAP, INNOVEX produced a design package for the installation of the Ozone Sparge Remediation and Treatment System. The treatment system, including the installation of ozone sparge wells, was completed by INNOVEX in September 2010, and the system was placed in full-time operation in October 2010. The ozone sparge system operated until September 2014, when it was shut down due to the absence of significant petroleum hydrocarbon concentrations in groundwater. Post-remediation rebound testing is currently being performed on a quarterly basis during the first through fourth quarters of 2015 to demonstrate that hydrocarbon concentration rebound has not occurred. National Park Service, Hazardous Material Cleanup, Point Reyes National Seashore, Bolinas, California. Naval Facilities Engineering Command, Technical Evaluation of Petroleum Contaminant Sources, Hunters Point Naval Shipyard, San Francisco, California. Russ Chapin, Jr. | Chapin Bros Inc.